Wales were defeated on Friday night in Paris 21-16 as hosts France destroyed their hopes of achieving a back-to-back Grand Slam, which would have been the first time since 1909. Eight successive Six Nations victories came to an end at Stade de France, in the tournaments first ever Friday night fixture. The Welsh blew a 13-3 halftime lead after looking in control following a great try from the speedy Lee Byrne and eight points from fly-half Stephen Jones. France fought back though as 20 year old Matthieu Bastareaud justified his selection by Marc Lievremont, having an excellent game. Surprise choice at fly-half Benoit Baby and goalkicker Morgan Parra both silenced the naysayers. Parra slotted three penalties and a conversion as France edged the try-count through scores by flanker Thierry Dusautoir and wing Cedric Heymans. Wales will be ruing missed chances as they had the opportunity to equal the Six Nations record of nine wins in a row, jointly held by England and France. Welsh coach Warren Gatland accepted that his side lost to the better team. "There were no excuses the better team won," he said. "We were 13-3 up and we needed to be a bit smarter. "If we had scored just before half-time it would have made it a different game. "France were a bit more desperate than we were and they had been under a lot of pressure as a team. That galvanises a team and brings the best out of you. "This wasn't a game that got away from us we are just disappointed with our performance. 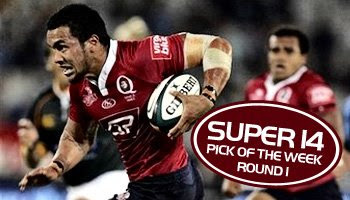 Round 3 of the Super 14 is already under-way so better late than never, we've got a pick of the best tries for you from Round 2. With only a handful of high scoring matches, a few of these tries come from the same matches, as it was the Bulls in particular who put on an impressive showing against the Blues in Pretoria. The powerful Pierre Spies scored two excellent tries, showing exactly how blessed the Springboks are at number 8 with strong, fast runners. Ryan Kankowski, the other Bok contender for the Eightman position this year, finished off a nice try of his own as the Sharks beat the Lions. League convert Timana Tahu got on the end of a nicely placed Kurtley Beale crosskick as the Waratahs beat the Chiefs in Sydney, while Bryan Habana showed that there's no substitute for raw gas with his nice chase to score against the Blues. The most exciting finish to a match so far this year though, has to the the Brumbies vs Crusaders clash in which Mark Gerrard scored a try with time up, equalling the scores before Stirling Mortlock kept his head to kick the winning conversion. All in all, some nice tries for those of you who missed them. We hope you enjoy. There was plenty of focus on the much anticipated Tana Umaga return on Friday night, but it was overshadowed slightly by a 22-13 win for Stade Francais over Umaga’s Toulon. Toulon scored two tries to Stade’s solo effort, but it was Lionel Beauxis who kept them in front. When the Parisians did score, it was a great try that involved a former Rugby League star and a young, up-and-coming Frenchman. Mark Gasnier, who is looking more and more comfortable in Union every time he plays, made this great break with a fantastic step that left Sonny Bill Williams and Tana Umaga in his dust. It was the tank-like twenty year old Mathieu Bastareaud, the cousin of Arsenal footballer William Gallas, who then collected the return pass and powered over the line. Bastareaud was a standout player in the IRB Junior World Championship, and has since been impressive with Stade Francais, earning him a crack at Wales this weekend in the Six Nations. French coach Mark Lievremont is giving him a chance to prove himself after his recent good form. "We had to choose between Mathieu Bastareaud and Damien Traille, but Traille is ill and only played an hour while Florian Fritz is still suspended," Lievremont said. "Mathieu has the profile to come into this team and bring his determination and power. He has played well for Stade Francais". France play Wales this Friday night, causing somewhat of a stir with the traditionalists. It promises to be a cracking game though in which young powerhouse Bastareaud will be giving his all. Striving to bring you a more enjoyable and informative rugby experience here on Rugbydump, we thought it would be handy to experiment with a new feature that will be a great way for us to share interesting rugby titbits we come across. 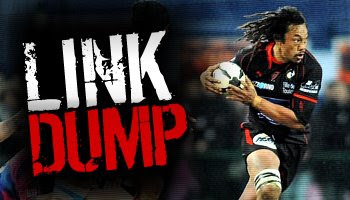 LinkDump will be posted sporadically throughout the week, and will feature hand-picked links to topical and informative rugby articles, funnies, and sometimes videos. While this format may not work for everyone, we have a lot to share and hope that some will enjoy the random, interesting links that you may not have come across otherwise. Click the link, view the pages, but don't forget to come back here and comment and discuss. Please also leave feedback via email or comments as to whether you enjoy this feature or not. We'll work on it as time goes by, improving, tweaking, and ultimately, perfecting. Michael Lipman requiring brain surgery? Bath and England flanker Michael Lipman has had an astonishing five concussions in six months, leading to serious concerns that he may need surgery to prevent further damage. Week two of the Super 14 has just passed, with a few stand out names and performances from Cape Town to Canberra. PlanetRugby have taken a look at who they see as the top 15 players of the past weekend. 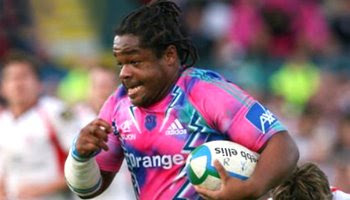 Toulon coach and former All Black Tana Umaga made his comeback this weekend as Toulon took on Stade Francais. Umaga, now 35, played alongside Sonny Bill Williams. Short video of the moment of his return is linked. Since professionalism kicked into gear after the 1995 World Cup, we've seen a tremendous change in the way the modern day rugby player looks physically. Bigger, faster, stronger. Or are they? Here's a nice looking pic we threw together of Welsh flyer Leigh Halfpenny evading English workhorse Joe Worsley in their recent meeting in the Six Nations. We'll share more interesting pics as we come across them. 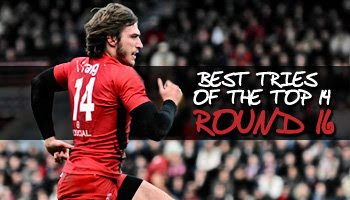 We have another Best Tries of the Top 14 video for you today, this time from last weekend's Round 16 in the star studded top league of France. Round 16 produced a few classic matches with superb tries from Toulon, as featured here, Perpignan, Stade Francais, and Clermont Auvergne. Take note of Dan Carter’s deft kick through for the Maxime Mermoz try, coming in at number four on this vid. Carter showed the type of brilliance he’s known for - making the complicated look easy. Unfortunately for Carter, Perpignan, and rugby fans all over the world, he was injured in the same match after a collision with opposite number Juan Martin Hernandez and will be out for some time. Maxime Medard finished off a fantastic Toulouse team try, but it was Toulon who feature strongly as we see some great touches in their match against Mont De Marsan. The thus far disappointing Sonny Bill Williams finally showed what he can do, scoring an excellently taken try, finally giving the fans something to get excited about. While still new to Union, and after a few injury problems, perhaps this will now be the spark he needs to lift his game to the high standards we all know he’s capable of reaching. Enjoy the tries and feel free to leave your thoughts on your favourites, whether you think Sonny Bill will continue to improve, or if you think Dan Carter’s performances and subsequent injury is perhaps the biggest disappointment of the year so far. Argentina produced a fantastic win at the USA Sevens tournament in San Diego this past weekend. Beating England 19-14 in the final, they won only their second ever Sevens World Series title. Behind 14-5 at halftime, the Pumas came back strongly with tries from Martin Rodrigues and Lucas Amorosino, before their defence muscled up to hold England at bay for a full five minutes. Tom Biggs and Ben Gollings had both scored first-half tries for England, either side of one by Argentina captain Santiago Gomez Cora. Argentina's Duncan Forrester said even he was surprised to win this tournament. Forrester said normally people expect South Africa, New Zealand and England to win these tournaments, but he thinks they were in good form after a good performance in Wellington. The win opens up the race for the 2008-09 World Series, as England and South Africa are now joint-top on 60 points, eight clear of New Zealand on 52. Argentina lie fourth with 48 ahead of Fiji, Kenya and the USA, who take 12 points from their home event. Note: If you're in the US and would like to see coverage of the event for the first time ever on a national broadcaster, check out ABC's show this Sunday at 5pm EST. More info here. The 2009 Super 14 got underway this past weekend with matches in Australia, South Africa, and New Zealand. With much anticipation for this years tournament, the first round produced some exciting encounters. 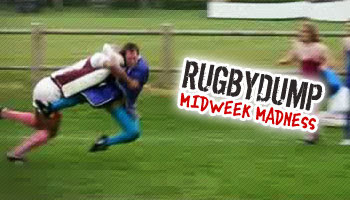 We’ve picked a few of the better tries from the busy rugby weekends action to share with you here. As the tournament progresses we’re sure to see plenty of quality action coming from the top domestic tournament in the Southern Hemisphere. In the clip you’ll see a fantastic team try from the Lions against the Cheetahs, two excellent solo efforts from Daniel Bowden and Digby Ioane, and a few others that we felt were worth showing. Enjoy. With the San Diego leg of the IRB Sevens having ended this past weekend in the USA, we’ve come across a quick funny that we thought would be well worth sharing for those of you who like to see some of the more unique goings on in the rugby world. This years tournament produced a whole host of surprising results, which is in essence one of the best things about Sevens rugby – everyone has a chance of pulling off an upset on the day. In this particular match it was home team the USA who took it to the Springbok sevens side in the hope of impressing the local fans. They did just that, as they led the match for some time, giving the Bok side a real scare before the experienced visitors won 15-14 in a close and exciting match. This comical moment happened shortly after kickoff though, as young Bok flyer and Grey Bloem high school sensation Robert Ebersohn showed us an example of his athleticism after being ankle tapped from behind. Ebersohn, who made his Currie Cup debut last year at the age of 19, is a sure thing for higher honours in the upcoming years. Along with his twin brother, Sias, the two of them made a huge impact at high school level, with Robert since having made the step up, featuring strongly on the Sevens scene. Remember the name, as you’ll hear it a lot more in the future, preferably for quality rugby action though, not amusing forward rolls during play. Italy signaled their intent early on against the Irish in Rome this past weekend. In order to compete, they needed to be pumped up and take the physical battle to the opposition. They did just that within 30 seconds of kickoff, but it went horribly wrong, resulting in them being down to 14 men from the get-go as fullback Andrea Masi was handed his marching orders. Masi flew in on opposite number Rob Kearney with a wild and reckless challenge that sparked somewhat of a brawl within a minute of the match getting underway. Masi received a yellow card for the dangerous tackle, and has since been cited, with his case being scheduled to be heard by an independent Six Nations three-man disciplinary committee in London on Wednesday. If found guilty, Masi will more than likely be banned for Italy’s crunch clash against Scotland, the only other side yet to record a win in this years tournament. With the incident occurring shortly after kickoff, leeway was seemingly given to Masi, with a tackle of this nature surely being worthy of a red normally. So despite him on his way to a citing commission on Wednesday, the referee’s decision is still up for debate. Was the yellow card sufficient, considering when the incident occurred, or should it have been a straight red as it was high and clearly dangerous? There’s been a six week break in the Guinness Premiership, but action got back under way this weekend as last years finalists, Wasps and Leicester, met in a fiery Adams Park clash on Sunday. The match ended 36-29 to Wasps in their first home victory over their rivals since 2002. They were unable to secure the bonus point though, and let in two late tries which meant Leicester left with two points themselves. As always, when these two meet there’s no love lost, as was seen when Samoans Daniel Leo and Alesana Tuilagi got to grips in the 28th minute of the match. It kicked off from practically nothing, but resulted in both players falling over the advertising boards as they exchanged punches, with Leo receiving a nasty gash below his eye. Both players were handed yellow cards. Less than a minute after play resumed, we saw another south sea islander, Seru Rabeni, put in a massive hit on young Wasps center Dominic Waldouck. The hit looked spectacular to say the least, and in real time led the commentators to believe it was worthy of a red. But upon seeing the replays, it was perhaps only marginally late, and nothing more. Common sense prevailed thankfully as the hard hitting Fijian Rabeni was given a talking to, and nothing more. Wasps have confirmed that the England trio of James Haskell, Riki Flutey and Tom Palmer will leave the club at the end of the season to play in France. Ireland secured a scrappy win over Italy at the Stadio Flamino on the weekend, taking them to the top of the Six Nations table. Luke Fitzgerald crossed twice with Tommy Bowe, David Wallace and Brian O’Driscoll also touching down against a limited Azzurri, who ran out of ideas after a rousing first 35 minutes. Ireland crushed their resistance by cranking up the pressure at key moments, leading to scores for Fitzgerald and Wallace either side of the interval that swept them out of sight. Luke McLean contributed all of Italy’s points with three penalties and, for all their possession and spirit, Nick Mallett’s team never threatened the visitors’ line. The second half wasn’t pretty as Ireland failed to put the Azzuri to the sword in a half in which they dominated, but also had a large error count. There were however late tries from Fitzgerald and O’Driscoll, making the final score of 38-9 make the match look one sided, when in reality, it wasn’t. 'We're happy to have won. The scoreline may flatter us but we'll take anything we can get,' said captain O'Driscoll. 'It's pleasing that things didn't start well for us but the longer the game went on the better we got. 'We were patient and knew we'd have to wait to break them down before taking our opportunities. 'They didn't score a try and that's because of our defence, not because of their lack of ability. Things didn't click for them today. Reigning Six Nations champions Wales stayed on course for successive grand slams with a nail biting 23-15 victory over a much-improved England at the Millennium Stadium on Saturday. England went into the match as underdogs but outscored Wales two tries to one, despite being down to 14 men after two sin-binnings. But ultimately it was this indiscipline which cost England as Wales kicked six penalties through Stephen Jones and Leigh Halfpenny. Halfpenny more than played his part with a successful 46 metre penalty and then by scoring Wales's only try, where the 20-year-old Cardiff winger's pace ensured a four-on-two overlap was not wasted. "He's improving week to week," said coach Warren Gatland. "He's a young kid and he's getting better and better." England manager Martin Johnson, on the wrong side of the result, was convinced his team should have emerged from the heavyweight clash in Cardiff with a win. "We let the match slip away. We had opportunities to win and we didn't take them," Johnson told BBC Sport. Wales next face a crunch match in Paris against France. Flanker Fulgence Ouedraogo's second-half try and five penalties by flyhalf Lionel Beauxis gave a sluggish France a 22-13 victory over Scotland at the Stade de France on Saturday. Scotland held their own in the first half and winger Thom Evans added to two earlier Phil Godman penalties with a try ten minutes from time but the visitors never seriously threatened to beat the home side. France coach Marc Lievremont, who said before the match that a loss would be a "humiliation", was disappointed by a series of French errors and a failure to break down a determined Scottish defence more decisively. "There was a lack of precision, too many mistakes," he told a news conference. "I had been hoping for a nice evening, spending Saint Valentine's with my wife but I think I'm going to have to be getting in a video session to see what went wrong." Scotland captain and scrumhalf Mike Blair said the team had battled well in the face of a lopsided 7-3 penalty count. "There were things that went against us and we were still right in the game against a good French side," he said. The Five Nations of 1999 will forever be remembered for the day that Wales beat England at Wembley in the most dramatic of circumstances. 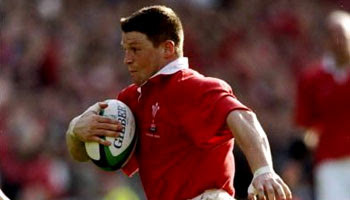 Welsh and Lions centre Scott Gibbs wrote his name in the history books, as a few seconds of brilliance turned him into a legend for all of time. Ten years ago, the outstanding Millennium Stadium as we know it today was under construction, so, in a strange twist of events, Wales adopted Wembley Stadium, in England, as their ‘home ground’. It was England, the visitors, who came to Wembley needed a victory to secure the Grand Slam. As you can see by this awesome video, it was all about Wales pre-match, and one had the feeling something special might happen. England led the game right up till the end before one last Welsh lineout meant that the Welsh had a chance to create history. A fantastic lineout followed, shortly before the little tank Scott Gibbs came barging through the line at great pace and a superb angle, beating English players with pure instinct before diving over the line for one of the greatest moments in rugby you’re ever likely to see. But it wasn’t over yet, as record points scorer Neil Jenkins still had the conversion to take to seal the win. If there was ever a man you’d want lining up for that kick though, Jenkins would be him, as he proved by calmly slotting the ball over as if he were on the training ground. Wales won 32-31, taking the Grand Slam away from England, and handing Scotland the Five Nations Championship on point’s difference. Former Scotland player and revered coach Jim Telfer was at home, watching the events from Wembley unfold on TV. "I always liked that wee bugger Gibbs," he said. Note: The try and conversion are included below for you to watch again. As the 2009 Super 14 kicks off today, we’ve got another video for you from a past tournament that featured some fantastic tries and close encounters. The Crusaders began their dominance of the tournament in 1998 with their title victory, and continued that supremacy by winning the next two years, marking their impressive three year stint as the side to beat. 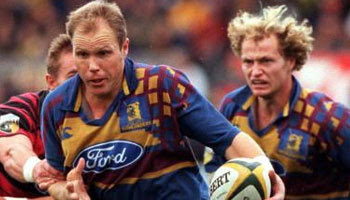 Ten years back, in 1999, they faced the Otago Highlanders in the final in Dunedin. The Crusaders won 24-19 in a closely fought final, lifting their second Super 12 title. In 2000 it was again the turn of the men in red from Canterbury, as they beat the Brumbies in another tight and tense final, with 20-19 being the score in the end. This clip features a few more classic tries from the tournaments, with some of the big names featuring nicely. Look out for a young George Smith, nineteen years old at the time, scoring a neat try. Enjoy, and here’s looking forward to another classic season of Super 14 rugby. 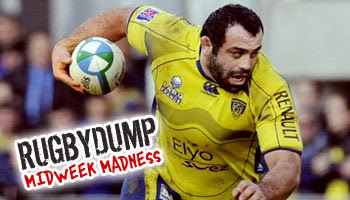 We came across this rather amusing try from the recent match between Clermont and Bayonne in the French Top 14. Big Georgian prop Davit Zirakashvili dived over for this funny looking five pointer after kicking the ball ahead clumsily. The look on the big guy's face as he realised he'd possibly fluffed it was priceless. It only took a few seconds though for him to realise that ball had bounced off the corner flag and stayed in play. So along with the help of one of the opposition players, who gave him a nice push in the back, he pounced on the loose ball for one of the most unique prop tries you're likely to see. The 2009 Super 14 kicks off this weekend as we get to see the best provincial sides in the southern hemisphere do battle for the honour of top dog as all sides will once again look to challenge last years champions, the Crusaders. This week we’ll be taking a look back at some previous seasons of arguably one of the best domestic competitions around. With the rise of professionalism, the inaugural Super 12 tournament kicked off back in 1996, with the final being contested by the Auckland Blues and the Natal Sharks. Auckland dominated for a few years, with players such as big Joeli Vidiri and Jonah Lomu featuring prominently. 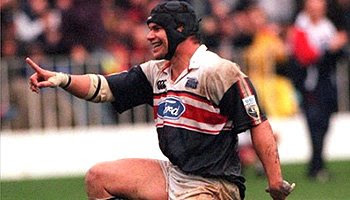 The Blues, with a young Carlos Spencer leading the way, won again in 1997 before they were outdone in 1998, with the emergence of what would be the most successful team in Super Rugby history – the Crusaders. This clip shows tries from some of the top teams throughout those three seasons and will bring back some great memories for those who watched the matches and players at the time. It’s also a collection that gives great insight for those who’ve never seen Super 12 footage from the era. Scotland’s wing Simon Webster and prop forward Geoff Cross both knocked themselves out dramatically against Wales on the weekend. Webster while making a big hit, and Cross in an attempt to challenge for a high ball. Both players are now serious concerns for coach Frank Hadden ahead of Saturdays Six Nations match against France. Both suffered bad head injuries from their mistimed tackles against the Welsh at Murrayfield. Webster seemingly got substituted, but was later seen on his knees at the time that Cross himself was being carried off. Webster was sent from the pitch by referee Alain Roland, as was Cross, who received a yellow card while on the stretcher for his reckless challenge on Lee Byrne. Team doctor James Robson said on Monday in a statement that both players had slept soundly on Sunday night. "Simon is fully conscious today as he was last night. He has had a good night's sleep and will now be subject to the usual protocol after a head injury. Geoff also had a good night's sleep and will be subject to the same protocol as Simon. He also has strains to both knees." Players are not allowed to take part if still suffering from the effects of concussion. The protocol involves the player being monitored through various degrees of physical activity before being examined by a neurologist and it would only be at that point that he would get clearance to resume. Wales swept aside the challenge of Scotland26-13 at Murrayfield on Saturday as they got their Six Nations defence off to an impressive start. Coach Warren Gatland refused to get carried away with the win though, insisting they still have plenty of work to do. "This has been a tough place for Wales to come over the years, so I have to be happy with the result. "We have put ourselves in a good position, but we are bearing in mind that there are four games to go - and only a six-day gap before facing England. That will be very physically demanding for the guys." "I was delighted with the accuracy of most of our play, but there is also plenty for work on,” Gatland stressed. "It was also important for us to maintain our discipline, and - other than the late yellow card for Martyn Williams - we did that." Despite many missed place kicks, Gatland wasn’t concerned. “Maybe it did put us under a little pressure at times, but that will be sorted out." 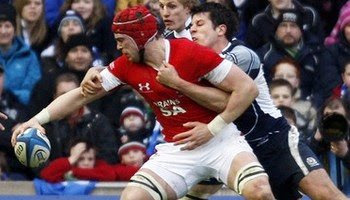 Tom Shanklin, Alun-Wyn Jones, Leigh Halfpenny, and Shane Williams all scored for Wales, with Max Evans grabbing Scotland's only try. Welsh powerhouse centre Jamie Roberts, named man of the match, said he was looking forward to playing England at the Millennium Stadium. "It was an absolutely fantastic performance first half - they had us on the edge of our seats at the end but fair play to Scotland they made us work hard," said Roberts. "I'm looking forward to next week - bring on England." Ireland came out victors against France at Croke Park in Dublin on Saturday with an excellent victory over the side that outdid them for the championship in 2007. It was the first victory in eight matches for the Irish against France and provided a perfect start for coach Declan Kidney on his Six Nations debut. "In some of the Ireland-France matches recently I think the lads have been a bit unlucky,” Kidney said afterwards. "A bounce of a ball could have won other games for them so it was nice a few things went our way today." "I'm just delighted for the players, I keep saying it but you don't believe me. "It's not about me, it's about everybody's efforts. Somebody has to be in this seat." "The way we reacted after that drop goal typified a team that learned a lot from two years ago," captain Brian O'Driscoll told a news conference, referring to Lionel Beauxis's kick that briefly put the French within a try of victory late on. "The way we hunted them down and weren't going to give it up to them easily. Maybe there was a little bit of knowledge in the team second time around." O'Driscoll said: "We're where we want to be. We've played one game, we've won one game, we're happy with our performance." Harry Ellis scored two tries as England defeated Italy 36-11 in the opening match of the 2009 Six Nations on Saturday. Andy Goode, Riki Flutey and Mark Cueto also touched down as England outscored Italy five tries to one. Goode kicked four conversions and a penalty. Martin Johnson’s Six Nations campaign got under way in a less than convincing manner, with most of the English tries coming from the visitors errors. Nevertheless, a win is a win, and a good start to the tournament. 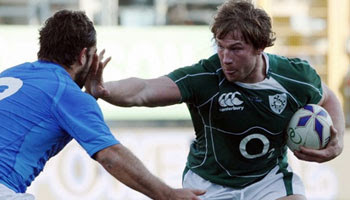 Italy’s coach Nick Mallet experimented with playing classy flanker Mauro Bergamasco at scrum half. It failed dismally, as he had an absolute shocker which led to him being substituted at half time. With a regulation number nine on, Italy looked a far more dangerous side in the second half, creating opportunities. England finished stronger though, playing some of their best rugby in the last five minutes. It was a scrappy match, but a fair result on the scorecard for England. Next week they take on Wales, which promises to be a far more exciting encounter. As the 2009 Six Nations kicks off this weekend, we thought it would be a good time to squeeze in a nice review of last years tournament. Wales came out trumps as they dominated winning five out of five matches, thriving under their new coaching team of Warren Gatland, Shaun Edwards and Rob Howley. They won the Grand Slam with a resounding four-point margin from England and France, with a disappointing Ireland finishing fourth, ahead of Scotland and Italy. Over the course of five weekends throughout February and March, 30 games of international rugby were played in six top European cities, with 595 points scored, all of it watched by tens of thousands of travelling fans, and a television audience in the millions. 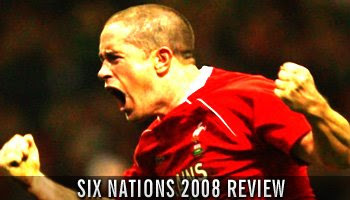 This extensive review takes us through all the highs and lows of a fantastic tournament in which we saw a little man named Shane take centre stage, burning up the turf on his way to becoming the IRB Player of the Year for 2008. The Six Nations kicks off in only a few hours from now, with the hype spreading from Dublin to Paris as all the talk is of who will be the team to lift the famous Championship this year. There was a media scrum to behold as the coaches and captains were presented at the official launch at the Hurlingham Club in London this week. This video gives you a nice look at what goes on at media junkets such as this, with the players being passed around from journalist to journalist, being asked the same questions over and over again. It’s all part of being a professional player though, and they take it in their stride as the media is an integral part of rugby as we know it today. It's usually pretty casual too, with plenty of laughs and banter going around. Enjoy the vid, and thanks to the beeb. The RBS Six nations 2009 kicks off this weekend as we see England play Italy, Scotland take on champions Wales, and Ireland host France. We came across this nice collection of Irish tries from over the years that we thought would be a nice way to get you in the mood for what is probably the biggest clash of the weekend. Dublin will be the venue as the hosts look to end their run of seven straight defeats to the French, following on from their disappointing fourth place finish in 2008 which saw the end of coach Eddie O’Sullivan. Now, under Declan Kidney, they’re hoping for a turnaround. Former Ireland captain Keith Wood believes Ireland's Six Nations title ambitions hinge on Saturday's opening match. "It's all about momentum and we have the hardest game first, against France," he said. "If we lose it we have no momentum. If we win it then we're in a very good place. "I had no expectations for Ireland up until three weeks ago, but they do have a chance. They have a settled look about them." Time will tell if Ireland can produce the type of tries we see in this video. But regardless of the result, the match should be a humdinger as the home crowd will be out in full force, both in the streets of Dublin, and at Croke Park. Hailing from the Blue Bulls in Pretoria to smash nearly every South African rugby record, including most Test tries and most Tests, this is a player we felt is more than worthy of recognition here on Rugbydump. A giant for a scrum half, he wore his heart on his sleeve, commanding respect whenever he played. Towering his counterparts and getting stuck-in more than most, it was Bill Mclaren who once quipped, 'He'd make a great flanker wouldn't he'. He left his mark on three world cup tournaments with his rugged defence and aggressive, sniping runs whenever he spotted a half gap. His tackle in the 1995 final on the then 'unstoppable force', the rampaging Jonah Lomu, was to go down in rugby folklore, but was to become just one moment in a long list of highlights, including a hat-trick against Scotland at Murrayfield, a Tri-Nations championship and the 1995 World Cup victory. While far from perfect technically, he is still considered by many to be one of the greatest scrum halfs to have ever played the game; Joost van der Westhuizen will be remembered as a proud man who gave his all for his beloved Springboks. He famously played the epic 1999 World Cup Semi Final against Australia with broken ribs, refusing to go off as he was captaining his country and would fight till the death. An inspiration to all with his style of play and never say die attitude, he was one of the most respected Springboks, and a legend of the game of rugby. 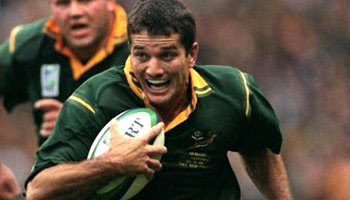 We've featured Joost as part of our build up to the British & Irish Lions tour of South Africa that kicks off in June. We'll be randomly featuring different players, teams, and incidents in our effort to contribute to the hype surrounding the biggest event of the year. With the help of a forum request, we’ve come across this rather amusing clip taken from a TV show that claims to mix science with lunacy. Described as a show featuring five lovable lads who probe the big questions in life and the universe, and who touch things they shouldn’t. Ready to be kicked in the crotch, electrocuted and have the fat sucked out of them, they sacrifice in the name of science. They’re guided by a professor, as seen in the clip, who provides the facts regarding these experiments. Rugby tackling was the order of the day in this clip, as you can see two of the guinea pigs being smashed around by a bunch of players, as the prof discusses the impact on a player’s body when getting hit, comparing it to that of a car crash. Funny to some, interesting for others, we figured we’d stick it up and see what you think. 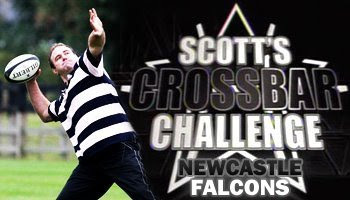 We’ve got another Crossbar Challenge for you this week, with the Newcastle Falcons being the team to take on big Scott Quinnell’s strong arm. For those of you who don’t know yet, the challenge is to throw a ball from 40 metres, over the uprights and between the posts, in one attempt. In the event of success, the player takes on Scott in a head-to-head showdown, vying to throw the ball the furthest distance possible from beneath the posts. With only Bristol second rower Dave Atwood beating him so far, the likes of Alex Tait, Steve jones, Tim Swinson, Spencer Davey, Phil Dowson, Tom May, Dave Wilson, Ross Batty, Micky Ward and Mark Wilkinson try their luck to take on Scott head-to-head. It was a more entertaining edition than the last, but we won’t give away the result, so have a look and see for yourself. Toulon came from behind to put in an inspired second half performance against fellow relegation candidates Mont De Marsan this past weekend. With all the talk focussing on the comeback of coach Tana Umaga, it was in fact another New Zealander who took center stage, sparking the impressive comeback which saw them score some fantastic tries. Playing at number 13, Sonny Bill Williams finally came right for the southerners as he played a staring role in the 38-22 win, sparking the home side that were down to 14 men twice during the match. The 15th man though, the crowd, lifted the team to victory as they came back from being 19-13 down at halftime. The win gave them a much needed bonus point, and lifted them two places in the table, up to 11th. Umaga stayed in the stands, so is yet to make his comeback appearance, but he was not needed as Czech international Martin Jagr scored a classy double, as did New Zealand winger Sinoti Sinoti. It was Toulon’s first league win since beating Biarritz in November. "Tonight we had cohesion, togetherness and we saw players like Sonny Bill Williams expressing themselves 100 per cent," Toulon assistant coach Aubin Hueber said. Note: Some great skill and tries shown, the contributor felt the music went nicely with it. Enjoy. From the amateur to the professional, each and every rugby player is part of 'something special'. We are all in it for different reasons, many of which we hope to pay tribute to in a second edition of 'Why I Love Rugby'. The second edition is back with more of the speed, skill, blood, guts and raw emotion that the first edition brought. We look at this as a free for all series with which we hope to encompass all that is great about rugby. Why I Love Rugby 2 is shorter than the first edition, but we hope that the quality and explosiveness of each clip can identify with everyone on some level. With the 2009 British & Irish Lions Tour edging ever closer, Rugbydump felt that a nod to Ian McGeechan was more than appropriate. Impending Lions tour aside, we may well have included McGeechan's profound words anyway, as they epitomize the essence of rugby. The sport means different things to different people, but for all us, to some degree, it is an opportunity of self-expression and perhaps more importantly, a good time. Wherever you go, whatever you do, be proud to be part of a global family of rugby men and women that have in common, if nothing else, a love for a very special game.